The byline for the Hollywood Fashion Secrets product line reads "From the Red Carpet to real life...wear every outfit with style and confidence." Well, we all know I'm not a red carpet gal, don't we? But I do appreciate confidence and style, so I was willing to try Hollywood Fashion Tape when the nice ladies of Hollywood Fashion Secrets sent me a sampling of their products. Hollywood Fashion Secrets has a whole line of products designed to produce confidence for you and your outfits. There are 3 practical categories of goods are available to save the day: Keep Your Clothes On, Bodacious Breasts, and Fresh Face. 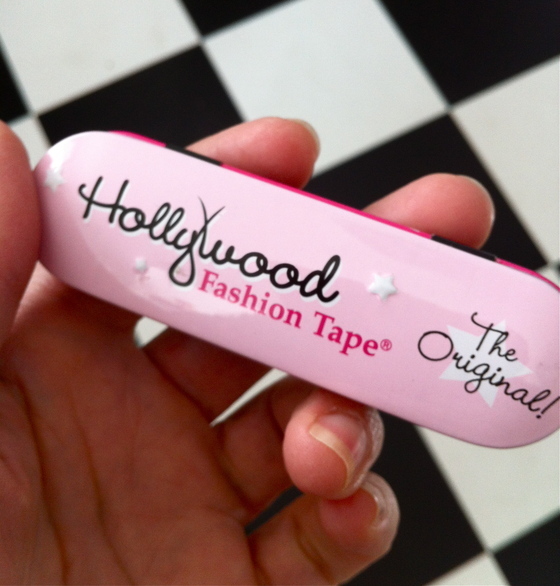 My favorite + most indispensable item in the bunch is the Hollywood Fashion Tape. They call it Secret No. 1, and the “The Original” Hollywood Fashion Tape: an easy-to-use, clear double-stick apparel and body tape. The 3M adhesive is gentle on skin, hypoallergenic and leaves no residue on fabrics. It’s also more discreet and fabric-friendly than safety pins. Hollywood Fashion Tape is useful for both everyday and special occasions. You get 36 pre-cut pieces of tape that are a 1/2 inch in width and 3 inches in length, in a charming metal box. Each strip of tape contains a removable backing on each side. You simply peel the backing from one side of the tape, press the tape firmly to your skin or fabric, remove the other backing, and apply the item to be secured. I found the tape easy to use, and very versatile. You can order your Hollywood Fashion Tape by clicking HERE. Disclosure: I received complimentary product from Hollywood Fashion Secrets in order to write this review. Well...I cannot imagine I will need it but you just never know...good to know that it works!! Cool! I can see a lot of uses for the tape. I use tape just like this for attaching breast forms and am surprised at how effective it works. The tape I buy, from a speciality website, is horribly expensive so I need to compare its cost to this brand. Thanks for the lead. Good to know! Thanks for the great tip! Hope you had a stunning weekend. Nice reminder! I forget about that tape. It comes handy especially in the summer. it sounds so much better than the usual safety pins! lSounds like a dream made for an outfit emergency! 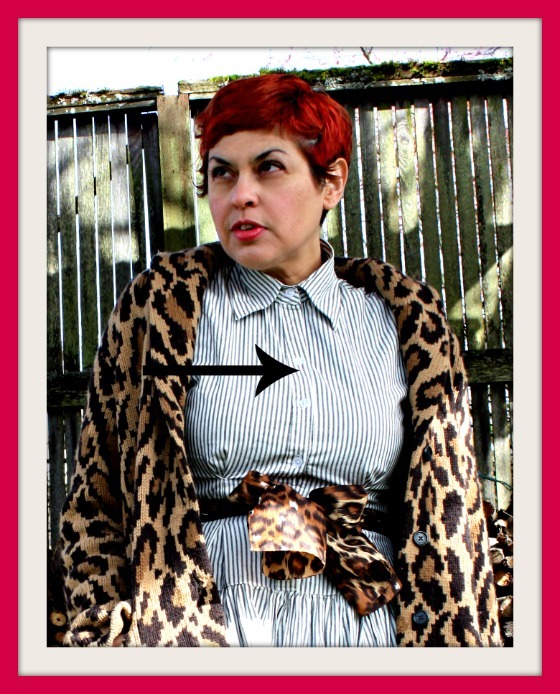 And you are beautiful in the leopard jacket with bow belt! I need some heavy duty tape for my breastest. Hm, I've wondered about similar products. So the strength of it would keep a gaping blouse tight? I'm laughing at Dora's comment! I use this stuff all the time. It's great for securing dress straps and low-cut necklines! If I'm going to a black-tie event, I put some extra in my purse in case another woman has an emergency. I tried some other old-fashioned toupee tape once but it practically ripped my skin off. LOVE Hollywood Fashion Tape. when you look at your own blog are there 'gadgets' all over the page? A screwdriver / hammmer combo??? I see these even when i log in from the internet! Is it because it's my computer or do you see them, too and if so, how do i shut them off? Funny isn't it - I didn't even know I might find this stuff really useful until reading your review. Mind you, I did buy and use toupe tape to keep in place the back of the backless dress I wore to my leaving-school-prom (although it hurt like hell when trying to extricate myself before climbing into my pyjamas). This looks rather more forgiving. I was just looking at some other options Hollywood Fashion Tape has come out with...I'm a fan of theirs and their packaging is cute too! Great a useful review! :) Loving your animal print too! Havent heard of that magic tape before, but it worth trying ... Hugs!! !